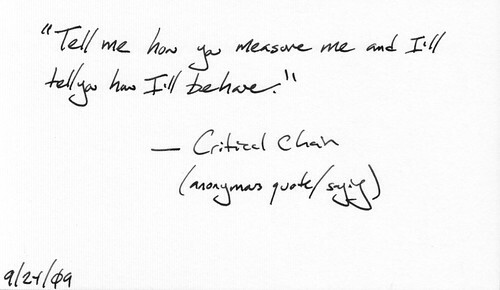 "Tell me how you measure me, and I'll tell you how I behave"
I live my life via 3x5 notecards. I look at them all day long. Consequently, I love looking at blogs like this one . And, for many reasons, I cannot stop looking at this card. Over the past year, I've become a pretty devoted user of BACKPACK, not only as a part of my implementation of GTD (see my GTD stuff here and here), but as a way to collect and organize information for our team environment at Redeemer Fellowship. In addition to the multiple productivity benefits BACKPACK has given me, I've thoroughly enjoyed reading the 37signals blog, Signal vs. Noise. They have consistently great stuff on a wide range of topics that interest me. What is most beneficial about the blog is the perspective that their team brings to whatever issue is at hand. My answer: You don’t create a culture. Culture happens. It’s the by-product of consistent behavior. If you encourage people to share, and you give them the freedom to share, then sharing will be built into your culture. If you reward trust then trust will be built into your culture. Artificial cultures are instant. They’re big bangs made of mission statements, declarations, and rules. They are obvious, ugly, and plastic. Artificial culture is paint. Real cultures are built over time. They’re the result of action, reaction, and truth. They are nuanced, beautiful, and authentic. Real culture is patina. Read the full post and comments for some great discussion, as well as George Ambler's reflections on the post. What is the One Thing People Need From Their Pastor? Leadership Journal: Pastoral Ambition, Does It Chip Away At Our Souls? Something has happened in the past thirty or so years that has shifted our pastoral ethic from one of faithfulness to one of productivity and success. I believe this has stirred the fires of ambition. Given the nature of our American culture, this doesn't surprise me. It also doesn't surprise me that the battle with ambition will be a ferocious one, for the tendency toward self-absorption plagues every one of us. I just wonder why this is not a front burner item that is being addressed with greater passion in the popular Christian media. It would be so refreshing to hear Christian leaders in some panel discussion copping to the fact that they struggle with it and it often drives their ministry. We all know it's there. If only we could start being honest about it. In addition, I would like to make it clear, that I would rather follow an ambitious pastor than a lazy one. I would rather follow someone who wants to change the world than one who simply wishes to throw stones. And while many pastors who are leading thriving ministries are passionate, sincere, hungry for God, and brimming with integrity, I must raise the question. Is our ambition godly? The first problem is the problem. The second problem is your inability to admit the problem, talk about the problem and ask for help in solving the problem. The first problem is that your customer service is lousy, you are an alcoholic, your products are boring, you don't treat your employees well. None of those problems are going to go away. None will go away, that is, if you don't acknowledge them, clearly and loudly and often. And ask for help. If you don't measure the first problem, then you have a second problem. If you don't measure the first problem, it's not going to go away, is it? Are you successful? Is your brand or your organization? It's a serious question. How do you know when you're successful--when you have enough market share or profit or respect or money? How do you decide what success is? This matters, because "never enough" is the wrong answer to anyone who wants to set realistic budgets or expectations or just plain enjoy the ride. A lot of organizational conflict comes from mismatched expecations of success. A lot of kids live unhappy lives because of unrealistic benchmarking from parents (as popular as that kid, as attractive as this one, as smart as the other one...). How's this: success is largely about keeping your promises. Resurgence has reposted an excellent sermon that Chris Seay preached in 2004: The Studious Saint. 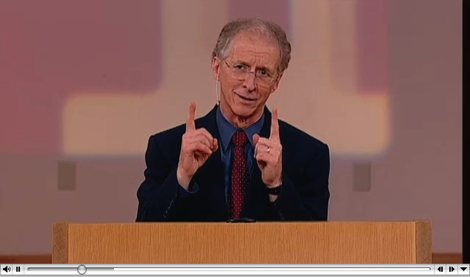 I have listened to this sermon on numerous occasions and have been challenged with something new each time. (2) This message served as my introduction to the excellent poetry of Taylor Mali. Here is the link to the poem that Chris quotes, entitled Totally Like Whatever, You Know?